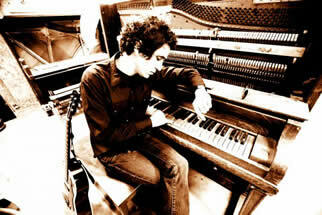 AJ CROCE was born to play music. With singer/songwriter Jim Croce as his father and Ingrid Croce as his mother, AJ moved to San Diego after the death of his father in 1973. Croce was completed blinded by a brain tumor at the age of four and it was during this difficult time that he began to play piano. Inspired by Ray Charles and Stevie Wonder before him, Croce started performing at nightclubs and private events as a pre-teen. At 19, he was signed to Private music and recorded two CDs before starting his own label, Seedling Records. Croces third release, Fit to Serve was produced by Jim Gaines, who had previously produced Van Morrison, Santana and The Steve Miller Band. After this release, he took a musical turn with Transit, which critics compared to John Lennon, Elvis Costello and Bob Dylan. He has opened for Carlos Santana, Rod Stewart, Aretha Franklin, Willie Nelson and many others.